Having invented the scroll wheel goodness of Convertbot and the simple, yet powerful clipboard management of Pastebot, the team at Tapbots now have their eyes set on taking on the common calculator with Calcbot, the company’s first hybrid iPad and iPhone app. Calcbot is a basic calculator with all the clinks, whistles, beeps, and polish that make every Tapbots app stand out from the crowd. 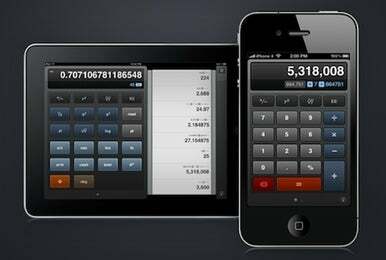 Turn the iPad sideways or swipe down on the iPhone, and you'll reveal a history tape that allows you to easily track progress, copy results and expressions to the calculator, or send computations to friends and foes alike via e-mail. Swipe the panel of buttons to the left to reveal a more advanced set of functions like sine and cosine, converting between degrees and radians, factorial goodness, and more. Though the list of functions available doesn't come close to a full-fledged RPN calculator like PCalc, it's plenty more than you'd come to expect from what initially looks like a basic, four-function calculator. Should you ever happen to get confused or need a little help with something, just tap the info button on the lower righthand corner and tap “Support” to browse a full list of frequently asked questions. Still stumped? Tap a link on the bottom to write directly to Tapbots HQ for assistance and emotional support. It doesn’t get more user-friendly than that. The app costs $1 for a limited time only and requires iOS 3.1 or later to run. As part of a special marketing deal with Tap Tap Tap and Macheist, a special mention of Calcbot on Facebook will also land you a copy of Realmac Software’s Socialite for free. That promotion might come off as a bit spammy to some, but look at it this way; it's a step up from telling the world you bought a brand new, virtual cow.